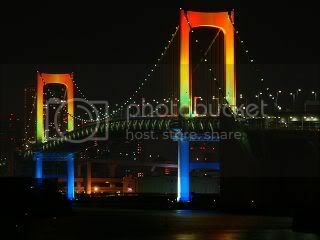 Light a candle and/or view Rainbow Bridge and more poems for your beloved pet or for someones grief. Go with me on difficult journeys, Never say, "I can't bear to watch it" or "Let it happen in my absence." Everything is easier for me if you are there. Reminded me of my old boxer dog and how about 2 or 3 years ago, I carried her into the vets on a blanket and talked to her and pet her and told her she was going to be ok and not be in any pain anymore and be with God now because I had to have her be put to sleep because she couldn't stand up. I was in the room with her too and the last thing she did before they put the shot in her was to lick me on the face. She came to me in a dream though a couple of nights later happy and running around as healthy and entergetic as a puppy to tell me goodbye and show me that she was ok now and happy and that I did the right thing. 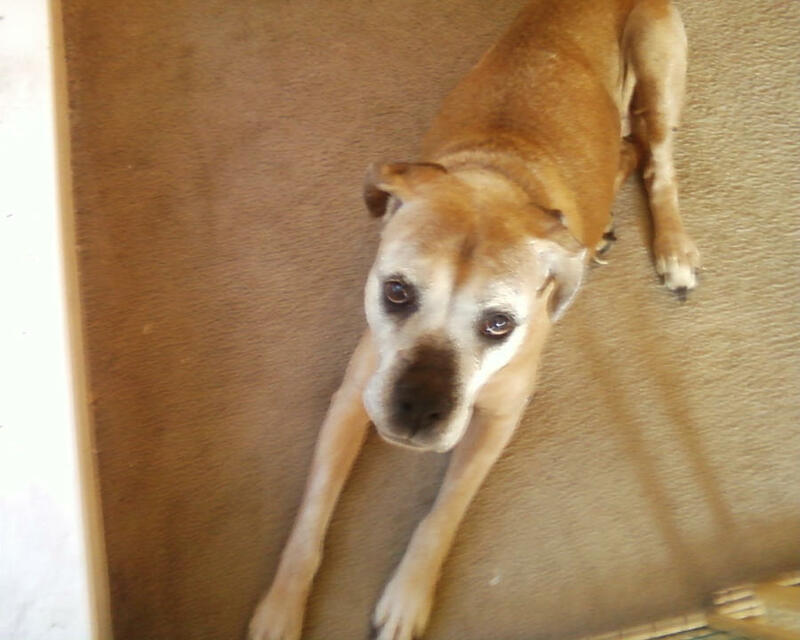 She was a great dog even if she could be destructive towards the tissue paper and one of those "breathing" stuffed animal sleeping toys they sell at the mall and she did bring dead birds into the house. Lol. I think part of the reason I loved her so much was because she was kind of bad sometimes if that makes any sense. I thought it just showed how intelligent she was and how she had a mind of her own. Ah, I have some good memories of her. I wish you guys could have met her. I don't think I'll ever have another dog quite like her even if I get another boxer. Her doing her goofy scent-marking roll to mark the house as her territory,but here I think she was just doing it to get attention because she realized every time I saw her doing it because I thought it was adorable, I would yell "Awww! Good girl!" and rub her belly and pet her and reward for her for doing it. Yep, I understand what you mean. this forum can also be used to talk about deceased pets in the past. yes, those poems always make me cry. I love the pictures of Roxie. The expression on her face is too cute. I'll bet you were able to understand her just by looking at her eyes and expression. the ideas. I am sure it was funny mostly "after the fact". 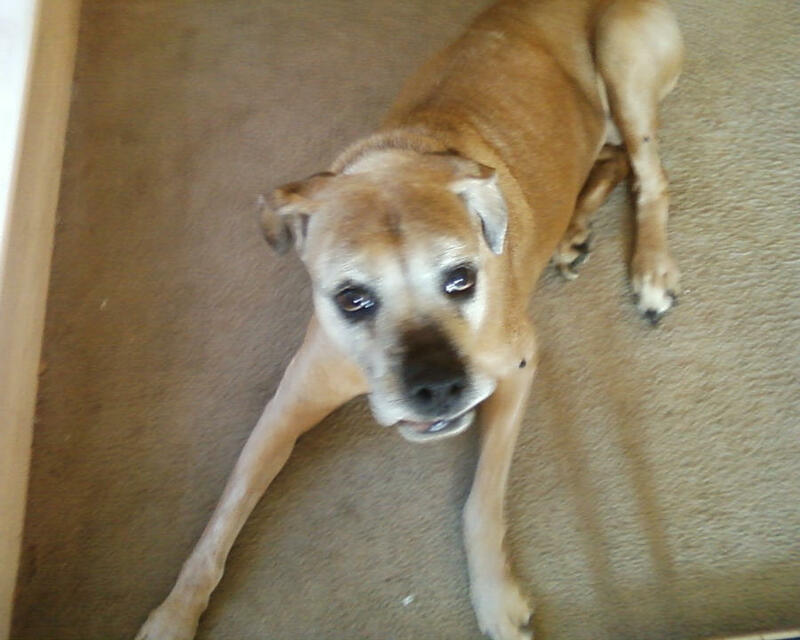 Roxie was a beautiful dog, and I can see it in her eyes, she was full of personality. the trick with the biscuit is too cute. 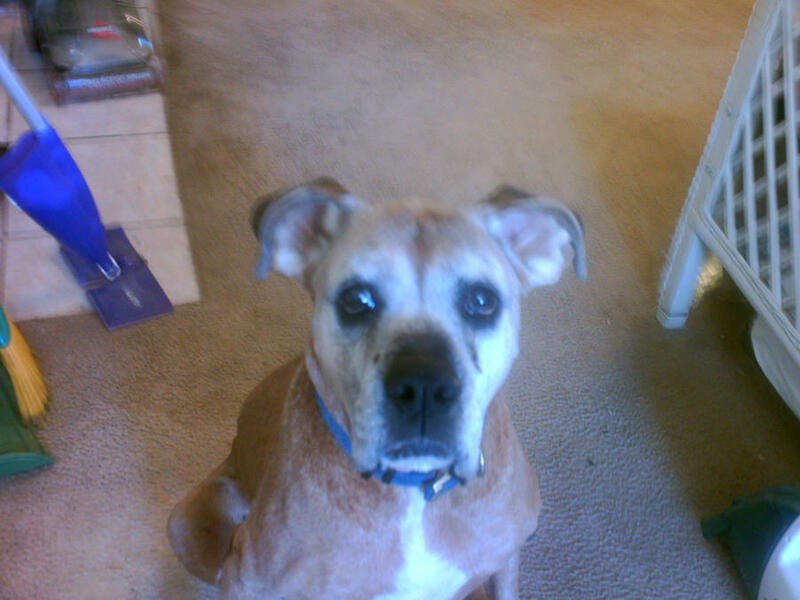 one of the hardest things to do is put our beloved pets down. 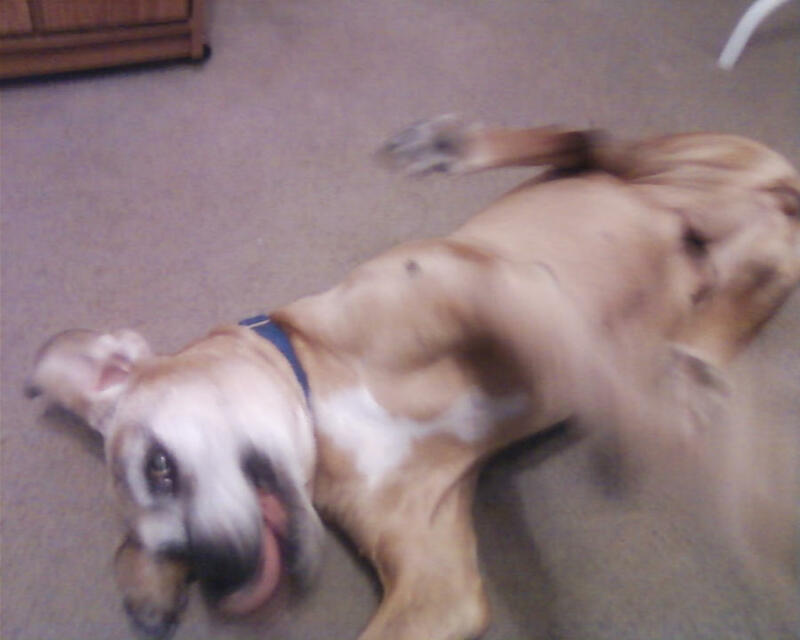 one of my dogs I put down about 5 years ago, was hard on me. she was only 5 years old. I will never forget the eye contact right before the needle was inserted. I cry every time I think about it. Thanks for lighting the candle. Thank you. Yes, she did have very expressive eyes. I always knew her "Sorry" face when she did something wrong before I even found what she tore up. She was such as little ham. Hard to stay mad at for long. She just loved attention. She didn't like to be left alone for long and she would sleep at someone's feet if they were on the bed downstairs. One time, I spent 3 weeks up visiting my dad while my aunt watched her and then I came home to my aunt's and it was really moving when she was waiting at the door,wagging her little stubby tail, her whole body shaking with excitement from seeing me again, not even angry at the fact that I disappeared for awhile,but just really happy to see me. Yep. It was mostly after when it was funny. Usually,for the first couple of hours, I would yell at her and then I would pretty much ignore her until I calmed down,but I never stayed mad at her for more than a day at must,but usually not that long. And then I just thought what she did was kind of funny and cute after that. Thank you. Yes, she had tons of personality. Like I said before she was quite a ham. She always knew how to use her cuteness to her advantage,especially to try and get out of trouble when she did something bad. I thought the trick was cute too,but sometimes I felt like it was kind of mean teasing her like that. My uncle was the one who made her do it. 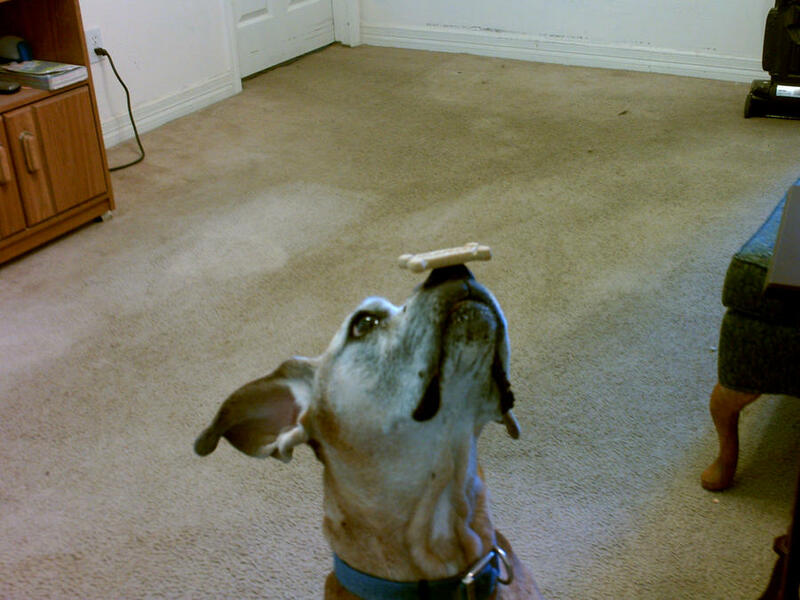 Still though, it did show how smart she was that she had self-control(well, depending on how long you made her hold the treat on her nose. If you tried for too long, she would get impatient and just eat it ). I know what you mean. It's hard enough losing a pet naturally,but having to make that difficult decision about if anything else can be done and is it worth it to keep them alive or will they just slowly suffer if I don't do something. I am so sorry about your dog. May she rest in peace. 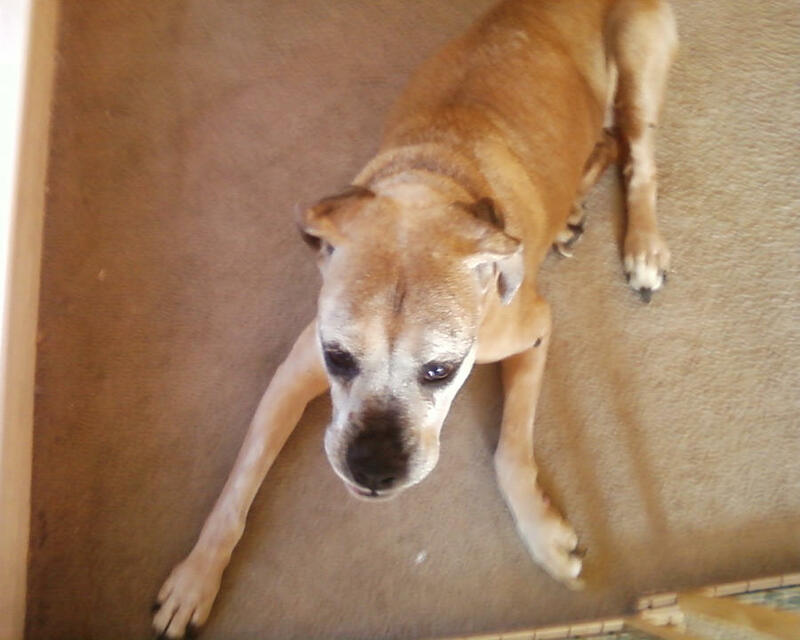 Mabye her and Roxie are playing together on the rainbow bridge. roxie sure did sound like a "ham". generally most dogs never get mad at their owner. guess, thats why I like dogs. roxie sounds and looks like she was full of personality. I am sure she will never be forgotten. thank you for lighting a candle for Fannie. a real good communication with her.